The Great Tribulation is a future time period when the Lord will accomplish at least two aspects of His plan: 1) He will complete His discipline of the nation Israel (Daniel 9:24), and 2) He will judge the unbelieving, godless inhabitants of the earth (Revelation 6 - 18). The length of the Tribulation is seven years. This is determined by an understanding of the seventy weeks of Daniel (Daniel 9:24-27). The Great Tribulation is the last half of the Tribulation period, three and one-half years in length. It is distinguished from the Tribulation period because the Beast, or Antichrist, will be revealed, and the wrath of God will greatly intensify during this time. Thus, it is important at this point to emphasize that the Tribulation and the Great Tribulation are not synonymous terms. Within eschatology (the study of future things), the Tribulation refers to the full seven-year period while the “Great Tribulation” refers to the second half of the Tribulation. It is Christ Himself who used the phrase "Great Tribulation" with reference to the last half of the Tribulation. In Matthew 24:21, Jesus says, "For then there will be a great tribulation, such as has not occurred since the beginning of the world until now, nor ever shall." In this verse Jesus is referring to the event of Matthew 24:15, which describes the revealing of the abomination of desolation, the man also known as the Antichrist. Also, Jesus in Matthew 24:29-30 states, “Immediately after the tribulation of those days . . . the Son of Man will appear in the sky, and then all the tribes of the earth will mourn, and they will see the Son of Man coming on the clouds of the sky with power and great glory." In this passage, Jesus defines the Great Tribulation (v.21) as beginning with the revealing of the abomination of desolation (v.15) and ending with Christ's second coming (v.30). Other passages that refer to the Great Tribulation are Daniel 12:1b, which says, "And there will be a time of distress such as never occurred since there was a nation until that time." It seems that Jesus was quoting this verse when He spoke the words recorded in Matthew 24:21. Also referring to the Great Tribulation is Jeremiah 30:7, "Alas! for that day is great, There is none like it; And it is the time of Jacob’s distress, But he will be saved from it." The phrase “Jacob’s distress” refers to the nation of Israel, which will experience persecution and natural disasters such as have never before been seen. Considering the information Christ gave us in Matthew 24:15-30, it is easy to conclude that the beginning of the Great Tribulation has much to do with the abomination of desolation, an action of the Antichrist. In Daniel 9:26-27, we find that this man will make a "covenant" (a peace pact) with the world for seven years (one “week”). Halfway through the seven-year period—"in the middle of the week"—we are told this man will break the covenant he made, stopping sacrifice and grain offering, which specifically refers to his actions in the rebuilt temple of the future. Revelation 13:1-10 gives even more detail concerning the Beast's actions, and just as important, it also verifies the length of time he will be in power. Revelation 13:5 says he will be in power for 42 months, which is three and one-half years, the length of the Great Tribulation. Revelation offers us the most information about the Great Tribulation. 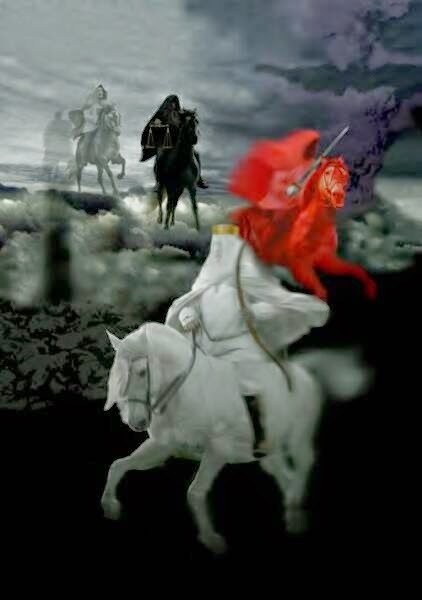 From Revelation 13 when the Beast is revealed until Christ returns in Revelation 19, we are given a picture of God's wrath on the earth because of unbelief and rebellion (Revelation 16-18). It is also a picture of how God disciplines and at the same time protects His people Israel (Revelation 14:1-5) until He keeps His promise to Israel by establishing an earthly kingdom (Revelation 20:4-6). The first great purpose of the Tribulation Period is to prepare Israel for the reception of her Messiah. Since the days of Christ's ministry the nation of Israel has been blinded to the glories and salvation of their Messiah. God has worked chiefly among the Gentiles during the past two thousand years. Romans 11:25-27 declares: "For I would not, brethren, that ye should be ignorant of this mystery, lest ye should be wise in your own conceits; that blindness in part is happened to Israel, until the fulness of the Gentiles be come in. And so all Israel shall be saved: as it is written, There shall come out of Sion the Deliverer, and shall turn away ungodliness from Jacob: For this is my covenant unto them, when I shall take away their sins." The Tribulation Period is referred to as "the time of Jacob's trouble" (Jer. 30:7) because God will be dealing with the nation of Israel specifically. The conversion of multitudes of Jews will occur during this period of time. Their eyes will be opened to the redemptive work of Jesus Christ and they will be saved. The salvation of elect Israel during the Tribulation Period will be for the purpose of preparing them to enter into the glories of the Millennial kingdom. God is going to use Daniel's seventieth week as a means to accomplish His purpose with regards to the nation of Israel as revealed in Daniel 9:24 which states: "Seventy weeks are determined upon thy people and upon thy holy city, to finish the transgression, and to make an end of sins, and to make reconciliation for iniquity, and to bring in everlasting righteousness, and to seal up the vision and prophecy, and to anoint the most Holy." These things have not yet happened with regards to the nation of Israel, but they will be accomplished during the Tribulation Period when God turns to His chosen nation. God's purpose concerning Israel during the Tribulation was revealed long ago in Deuteronomy 4:30-31 which state: "When thou art in tribulation, and all these things are come upon thee, even in the latter days, if thou turn to the LORD thy God, and shalt be obedient unto his voice; (For the LORD thy God is a merciful God;) he will not forsake thee, neither destroy thee, nor forget the covenant of thy fathers which he sware unto them." It is also significant to note that many Gentiles will also be saved during the Tribulation through the witness of converted Jews. The converted Gentiles will comprise the sheep nations mentioned in Matthew twenty five, who will also enter into the glories of the Millennial kingdom. The second major purpose of the Tribulation Period has already been alluded too. For thousands of years of human history man has been defying the holy government of God and rebelling against His laws. During the Tribulation Period God will pour out His judgments upon an ungodly world. Those who have been deceived by the false prophet and who have submitted to the unrighteous rule of Antichrist will be damned. II Thessalonians 2:11-12 declares: "And for this cause God shall send them strong delusion, that they should believe a lie: That they all might be damned who believed not the truth, but had pleasure in unrighteousness." A third purpose of the Tribulation Period will be to judge the apostate church known in Scripture as "MYSTERY, BABYLON THE GREAT, THE MOTHER OF HARLOTS AND ABOMINATIONS OF THE EARTH" (Rev. 17:5). She is called a whore because of her spiritual infidelity and prostitution of spiritual powers. This church, under the guise of Christianity, has perverted the true ways of God, given birth to numerous heresies, and has promoted a false worship during her existence. Through the centuries she has hounded, hated, and persecuted the true saints of God and is said to be "drunken with the blood of the saints, and with the blood of the martyrs of Jesus" (Rev. 17:6). She is also in league with Satan and the Antichrist. The false prophet who acts as the head of this ecclesiatical organization will aid the Antichrist and encourage idolatrous worship. She will be an apostate church with a universal appeal, allowing several beliefs to exist under her ecclesiatical umbrella. This "MOTHER OF HARLOTS" is the Roman Catholic Church and her apostate Protestant daughters who unite with her. She will unite with political Babylon only to be destroyed by it according to God's sovereign will (Rev. 17:15-18). Her final judgment by God will be the cause for rejoicing and praise among the saints of God in Heaven as Revelation 19:1-3 declares: "And after these things I heard a great voice of much people in heaven, saying, Alleluia; Salvation, and glory, and honour, and power, unto the Lord our God: For true and righteous are his judgments: for he hath judged the great whore, which did corrupt the earth with her fornication, and hath avenged the blood of his servants at her hand. And again they said, Alleluia. And her smoke rose up for ever and ever." An entire volume could easily be written explaining the details of the Tribulation Period. In fact, in order to do the Tribulation Period justice, Revelation chapters six through nineteen would have to be examined closely, as they comprise the most thorough picture of the seven-year Tribulation Period. We will examine only the main events that occur during the Tribulation Period. 1. II Thessalonians 2:7-8 declares: "For the mystery of iniquity doth already work: only he now letteth (Greek word katecho, meaning restrain or hinder) will let, until he be taken out of the way. And then shall that Wicked be revealed..." At the beginning of the Tribulation Period the world will find itself without the presence or the influence of the Holy Spirit, and thus in a state of moral, political, and spiritual chaos. Confusion, violence, and immorality will be the natural order of the day after believers are translated into the realms of glory and the influence of the Holy Spirit is taken from off the earth. 2. The state of moral, spiritual, and political anarchy will provide Satan with a perfect window of opportunity to unveil the Antichrist. Since the world will be in a state of moral and spiritual darkness, the Antichrist will arise as the one who provides answers to all of the world's problems. He will be an oratorical genius, a man of eloquence, who is able to deceive the masses with ease. He is described in Daniel as one that had "a mouth that spake very great things" (Dan. 7:20). II Thessalonians 2:9-10 describes the Antichrist in the following way: "Even him, whose coming is after the working of Satan with all power and signs and lying wonders. And with all deceivableness of unrighteousness in them that perish; because they received not the love of the truth, that they might be saved." The Antichrist will arrive on the scene proclaiming himself as the one who can solve the economic and social problems of the world. For a time the world will prosper under his reign which will only serve to enhance his power and control over the masses of humanity. Daniel 8:25 declares: "And through his policy also he shall cause craft to prosper in his hand; and he shall magnify himself in his heart..." Even now our world is being primed for a charismatic leader who will be able to unite the nations, promise peace, and be the engineer of a global economy that prospers. 3. Perhaps the greatest accomplishment of the Antichrist will be the peace pact that he signs with the nation of Israel at the beginning of the Tribulation Period. The world has yet to find a leader who can promise peace to the region known as the Holy Land. One of the first things the Antichrist will do during the Tribulation in order to establish his power will be to sign a peace pact with Israel. Daniel 9:27 declares: "And he shall confirm the covenant with many for one week..." Included within this covenant drawn up by the Antichrist will be the re-establishment of the Jewish Temple sacrificial system. This gesture of good will will only enhance the power, prestige, and popularity of the Antichrist among the masses of depraved humanity. 4. A new world order will be established during the reign of Antichrist. A confederation of European states will be at the helm of a new global economy. A global religion will also be established headed up by the false prophet as described in Revelation 13:11-17. The false prophet will encourage the nations in idolatrous worship of the Antichrist. One way in which he will exercise control over the masses will be to require everyone to receive the mark of the beast as Revelation 13:16-17 states: "And he causeth all, both small and great, rich and poor, free and bond, to receive a mark in their right hand, or in their foreheads: And that no man might buy or sell, save he that had the mark, or the name of the beast, or the number of his name." It is interesting to note that there is already technology that could put a biochip in the hand of every individual to identify them as having the mark of the beast. 5. During the first three and a half years of the Tribulation Period there will be a significant ministry carried on by two men as Revelation 11:3 reveals: "And I will give power unto my two witnesses, and they shall prophesy a thousand two hundred and threescore days, clothed in sackcloth." Because of the description given in Revelation 11:3-6 many believe these two witnesses will be Moses and Elijah, representing the law and the prophets, sent by God to minister during the first half of the Tribulation. The Antichrist will wage war against these two witnesses and they will be killed at the mid point of the Tribulation Period. By satellite all the world will see the dead bodies of the two men lying in the streets of Jerusalem for three and a half days. The depraved inhabitants of the world will rejoice in their demise, only to be shocked when God raises them up and takes them into Heaven (Rev. 11:7-12). Along with the ministry of the two witnesses, God will raise up 144,000 Jewish men, 12,000 out of each of the twelve tribes of Israel, to act as Tribulation evangelists (Rev. 7:4; Rev. 14:4-5; Matt. 24:14). Multitudes will be converted by the sovereign grace of God only to be martyred shortly after declaring their allegiance to Jesus Christ. Revelation 7:13-14 describes these Tribulation martyrs thusly: "And one of the elders answered, saying unto me, What are these which are arrayed in white robes? and whence came they? And I said unto him, Sir, thou knowest. And he said to me, These are they which came out of great tribulation, and have washed their robes, and made them white in the blood of the Lamb." 6. A flurry of significant events will occur at the midway point of the Tribulation Period. The two witnesses will be slain (Rev. 11:3-10). Satan will be cast out of Heaven by Michael and his angels (Rev. 12:7-9). This will mean real trouble for the inhabitants of the earth during the last three and a half years of the Tribulation as Revelation 12:12 states: "...Woe to the inhabiters of the earth and of the sea! for the devil is come down unto you, having great wrath, because he knoweth that he hath but a short time." Also at the midpoint of the Tribulation the abomination of desolation will occur when the Antichrist breaks his peace pact with Israel, does away with the Temple worship and sacrifices, and sets himself up as God in the Temple, thus desecrating the Temple. This abomination of desolation is referred to in several passages of Scripture. Daniel 9:27 declares: "And he (Antichrist, the prince that shall come v. 26) shall confirm the covenant with many for one week: and in the midst of the week he shall cause the sacrifice and the oblation to cease, and for the overspreading of abominations he shall make it desolate, even until the consummation, and that determined shall be poured upon the desolate." Jesus also referred to this event in Matthew 24:15 which states: "When ye therefore shall see the abomination of desolation, spoken of by Daniel the prophet, stand in the holy place, (whoso readeth, let him understand)." Paul also referred to this event in II Thessalonians 2:4 which states: "Who opposeth and exalteth himself above all that is called God, or that is worshipped; so that he as God sitteth in the temple of God, shewing himself that he is God." From the midpoint of the Tribulation Period until the end, the judgments and wrath of God become more intense and severe reaching their crescendo at the Battle of Armageddon when Jesus is revealed from Heaven to smite His enemies that are gathered for battle. 7. The judgments of the Tribulation are revealed in the seven seals, the seven trumpets, and the seven vials of the Book of Revelation. The details of these judgments are recorded in Revelation chapters six through nineteen. As the Tribulation progresses, the severity and intensity of the judgments will increase. It must be reemphasized that these judgments represent the wrath of God against unbelievers, not Satanic wrath against believers as Revelation 16:1 declares: "And I heard a great voice out of the temple saying to the seven angels, Go your ways, and pour out the vials of the wrath of God upon the earth." Time and space in this present volume prevent me from going into the details of the horrible judgments that will be poured out upon the inhabitants of the earth during the Tribulation Period. I will leave it to the reader to carefully study Revelation chapters six through nineteen. 8. After the judgment of religious and political Babylon (Rev. 17-18) the Antichrist will gather his forces and make his way to Armageddon (Rev. 16:16) to do combat against the Lord Jesus Christ. Zephaniah 3:8 declares: "Therefore wait ye upon me, saith the LORD, until the day that I rise up to the prey: for my determination is to gather the nations, that I may assemble the kingdoms, to pour upon them mine indignation, even all my fierce anger: for all the earth shall be devoured with the fire of my jealousy." The assembled masses, under the leadership of the Antichrist, will be defeated by the Lord Jesus Christ when He comes back from Heaven with the saints. There are four pictures of the Battle of Armageddon culminating in the Second Advent of Christ found in the Book of Revelation (Rev. 6:12-17; Rev. 14:14-20; Rev. 16:16-21; and Rev. 19:11-21). Perhaps the most graphic illustration of the destruction that will occur at the Second Advent of Christ is recorded in Revelation nineteen. Jesus will come back with His saints from Heaven to put down His enemies on earth as Revelation 19:15 declares: "And out of his mouth goeth a sharp sword, that with it he should smite the nations: and he shall rule them with a rod of iron: and he treadeth the winepress of the fierceness and wrath of Almighty God." Jesus will then cast the Antichrist and the false prophet into the Lake of Fire to suffer eternal punishment (Rev. 19:20). He will also bind Satan in the bottomless pit for one thousand years as He and His saints rule upon the earth in righteousness (Rev. 20:1-6). Thus, the most terrible time upon earth known to man will end with the Second Advent of Jesus Christ which will usher in the most glorious time the earth has known since the fall of Adam and Eve in Eden. The darkness of the Tribulation Period will give way to the brightness of the coming of the Lord Jesus Christ who shall reign upon the throne of David for a thousand years. The violence, bloodshed, and warfare that characterizes the Tribulation period will give way to the millennial blessings of unsurpassed spirituality, peace, and righteousness. The unrighteous and wicked reign of the Antichrist will give way to the glorious reign of Jesus Christ upon the earth. Though the Tribulation Period proves to be the darkest chapter in the history of man's existence on earth it will be followed by a most glorious and wonderful reign of righteousness. The Tribulation Period will consist of a seven year increment of time which will begin immediately after the 7 year peace treaty is signed with Israel and will conclude when Christ comes back with the saints in the Second Advent to establish His righteous rule of one thousand years upon the earth. The Tribulation Period is usually called Daniel's seventieth week because it is the last time frame in the seventy sevens of years recorded in Daniel chapter nine. Daniel 9:24-27 declares: "Seventy weeks are determined upon thy people and upon thy holy city, to finish the transgression and to make an end of sins, and to make reconciliation for iniquity, and to bring in everlasting righteousness, and to seal up the vision and prophecy, and to anoint the most Holy. Know therefore and understand, that from the going forth of the commandment to restore and to build Jerusalem unto the Messiah the Prince shall be seven weeks, and threescore and two weeks: the street shall be built again, and the wall, even in troublous times. And after threescore and two weeks shall Messiah be cut off, but not for himself, and the people of the prince that shall come shall destroy the city and the sanctuary; and the end thereof shall be with a flood, and unto the end of the war desolations are determined. And he shall confirm the covenant with many for one week: and in the midst of the week he shall cause the sacrifice and the oblation to cease, and for the overspreading of abominations he shall make it desolate, even until the consummation, and that determined shall be poured upon the desolate." Several things may be gleaned from this passage of Scripture in relation to the time frame of the Tribulation Period. First, the seventy weeks of years or 490 years deals specifically with the nation of Israel, Daniel's people, whose capital is Jerusalem, the holy city. The prophecy of Daniel's seventy weeks must be understood in relation to God's purpose concerning His chosen nation Israel. From Daniel 9:26 we know that the weeks of the prophecy must be interpreted as years. Jesus did not come as the Messiah to be cut off for the sins of His people 483 days after the decree of Artaxerxes in 445 B.C, but rather 483 years after the commandment. The Hebrews often used the term week to represent seven years. For example Genesis 29:27-30 records: "Fulfill her week, and we will give thee this also for the service which thou shalt serve with me yet seven other years. And Jacob did so, and fulfilled her week: and he have him Rachel his daughter to wife also. And Laban gave to Rachel his daughter Bilhah his handmaid to be her maid. And he went in also unto Rachel, and he loved Rachel more than Leah, and served with him yet seven other years." In the original Hebrew the word for seventy weeks is shibim meaning seventy sevens, without expressing days, weeks or years. The actual duration of the shibim is determined by the context. The Biblical calendar consists of 360 days or twelve months of thirty days. This may be calculated by examining Genesis 7:11-24 and Genesis 8:3-4. In the account of the flood we find that the five months from the seventeenth day of the second month until the seventeenth day of the seventh month are reckoned as one hundred and fifty days or thirty days to a month which equals three hundred and sixty days to a year. The first seven weeks of years is calculated from the time that Artexerxes gave the command to rebuild Jerusalem in 445 B.C. This took exactly 49 years just as Daniel 9:25 reveals. From the time that Jerusalem was rebuilt until the time that Jesus Christ was crucified was 62 weeks of years or 434 years. When you add 49 plus 434 you come up with 483 years as the time period between the rebuilding of Jerusalem and the time when Jesus Christ came to pay the sin debt for His people and redeem them from the curse of the law. Galatians 4:4-5 declares: "But when THE FULNESS OF TIME WAS COME, God sent forth his Son, made of a woman, made under the law, To redeem them that were under the law, that we might receive the adoption of sons." Since the first 483 years of Daniel's prophecy have had a literal fulfillment then it makes good sense to believe that the last seven years will also have a literal fulfillment. The Messiah was crucified after the 69 weeks and before the 70th week. However, there is a parentheses of an indefinite period of time between the 69th and the 70th weeks. It is not uncommon for there to be gaps in Old Testament Prophecy. There are prophetic gaps in all of the following Scriptures: Isaiah 61:1-2 declares: "The Spirit of the LORD GOD is upon me; because the LORD hath anointed me to preach good tidings unto the meek; he hath sent me to bind up the brokenhearted, to proclaim liberty to the captives, and the opening of the prison to them that are bound; To proclaim the acceptable year of the LORD, and the day of vengeance of our God..." There has already been a gap of almost 2000 years between the "acceptable year of the Lord" and the "day of vengeance of our God." It is interesting to note that when Jesus read this Scripture in the synagogue, He did not read the last half of verse two because its fulfillment was yet future (Luke 4:16-21). Hosea 3:4-5 is another example of a lengthy interval or parentheses of time: "For the children of Israel shall abide many days without a king, and without a prince, and without a sacrifice, and without an image, and without an ephod, and without teraphim: Afterward shall the children of Israel return, and seek the LORD their God, and David their king; and shall fear the LORD and his goodness in the latter days." The contents of verse four have already been fulfilled with regards to the nation of Israel, but the contents of verse five have not yet occurred, meaning that a great interval of time exists between the fulfillment of these two verses. The teaching of the great parenthesis of time between the 69th and 70th weeks of Daniel's prophecy is further bolstered by the fact that Jesus regarded the abomination of desolation spoken of by Daniel as an event yet future (Matt. 24:15-21). Jesus even identified this period of time as the Tribulation Period which is precisely what Daniel's seventieth week is referring too! The duration between Daniel's 69th and 70th week comprises the church age in which Christianity would be spread throughout the whole world. This makes sense to the student of prophecy because the church was a mystery that was not revealed to the Old Testament saints (Eph. 3:1-6). This is the reason for the great parenthesis of time between the 69th and 70th weeks of Daniel's prophecy. Because Israel rejected the ministry and Messiahship of Christ she was set aside by God. The New Testament Church was established as the means through which God would be glorified during the church age. Israel will not be restored and regenerated until the terms of Daniel's seventieth week are fulfilled (Dan. 9:24). Another way to figure the time frame of the Tribulation period is to examine two passages in the Book of Revelation. The first deals with the length of the ministry of the two witnesses before they are slain by the beast. Revelation 11:3 states: "And I will give power unto my two witnesses, and they shall prophesy a thousand two hundred and threescore days, clothed in sackcloth.” 1,260 days equals exactly three and one half prophetic years. The death of the two witnesses coincides with the midpoint of the Tribulation known as the abomination of desolation when the Antichrist breaks the covenant with Israel. At this point the Antichrist will reveal his true blasphemous intentions as Revelation 13:4-5 declares: "And there was given unto him a mouth speaking great things and blasphemies; and power was given unto him to continue forty and two months. And he opened his mouth in blasphemy against God, to blaspheme his name, and his tabernacle, and them that dwell in heaven." When you combine the three and a half year ministry of the two witnesses with the forty two months after the Antichrist sets up the abomination of desolation in the Jewish Temple, you come up with exactly seven years which is the exact time frame of Daniel's seventieth week. You will notice that power was given unto the Antichrist to continue forty and two months, implying that his ministry and reign was already in progress. He was revealed right after the Rapture, but the fierceness and cruelty of His unrighteous reign does not go into full force until the last three and one half years of the Tribulation Period. In the first three and a half years the Antichrist spends time deceiving the masses of humanity into thinking he is a social, political, and religious Messiah. In the last three and a half years, after Satan is cast down from Heaven, and given only a short time to work his devious plan, the Antichrist becomes more cruel and blasphemous. Daniel 11:36 describes the reign of Antichrist from the midway point of the Tribulation Period thusly: "And the king shall do according to his will; and he shall exalt himself, and magnify himself above every god, and shall speak marvellous things against the God of gods, and shall prosper till the indignation be accomplished: for that that is determined shall be done." Yet the reign of the Antichrist will be short-lived because Daniel 11:45 declares: "...yet he shall come to his end, and none shall help him." At the end of the seven- year Tribulation Jesus will come back with the saints, and the reign of the Antichrist and the ministry of the false prophet will come to a violent end as Revelation 19:19-20 reveals: "And I saw the beast, and the kings of the earth, and their armies, gathered together to make war against him that sat on the horse, and against his army. And the beast was taken, and with him the false prophet that wrought miracles before him, with which he deceived them that had received the mark of the beast, and them that worshipped his image. These both were cast alive into a lake of fire burning with brimstone." The end of the seven-year Tribulation Period will not only signal the end of the reign of Antichrist, it will also be the time when God pours out His Spirit in a miraculous way upon the elect nation of Israel. Multitudes of Jews will be converted when they see the Messiah coming in power and great glory as Zechariah 12:9-10 declares: "And it shall come to pass in that day, that I will seek to destroy all the nations that come against Jerusalem. And I will pour upon the inhabitants of Jerusalem, the spirit of grace and of supplications: and they shall look upon me whom they have pierced, and they shall mourn for him, as one mourneth for his only son, and shall be in bitterness for him, as one that is in bitterness for his firstborn." How I long for the grand and glorious day when the glorified saints come back with Christ to end the seven-year Tribulation Period. I long to see King Jesus put an end to the reign of unrighteousness and injustice. I long to see elect Israel restored to God's favor and possessing the land that was promised to her in the Abrahamic Covenant. I long to see the earth and all its inhabitants enjoying a Sabbath of rest for a thousand years. I long to see King Jesus exalted as king over all the earth, reigning in majesty and great glory. Zechariah 14:9 declares: "And the LORD shall be king over all the earth: in that day shall there be one LORD, and his name one."